With this impairment solution, you can compute single, general and portfolio value adjustments as well as the unwinding effect in accordance with IFRS. The browser interface makes it simple to navigate from the overview of all impairment cases and individual accounts to the expected cash flow profile. The provisioning calculated by the accounting software can be adopted or adjusted on the basis of diverging expectations with regard to cash flows and liquidation of collaterals. The integrated table of itemized value adjustments shows how the allowances may change over time. 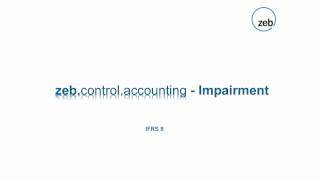 The impairment component of zeb.control.accounting supports all steps of the impairment process. For data preparation optionally, either data supply from the source systems or impairment detection by zeb.control.accounting is possible. The significance test uses the “Receivables Volume per Counter party“ criterion. Subsequently cash flows for individual transactions are generated and the present values of the collaterals are determined on the basis of utilisation forecasts. The specific provision calculation uses the delta of the individual transaction CF PV “before impairment“ and ”with impairment”. In the next step manual post-processing is done. Calculated values are available for release and booking for each individual transaction. But manual changes are also possible (e.g. PV, essentiality, collateral value, percentage indication of recoverable Cash Flow, risk provisions). Afterwards specific provision booking (inclusion / unwinding) takes place via the own system process. The flagging concerning impairment of an individual transaction automatically triggers a change in booking rules e.g. concerning unwinding; unexpected incoming payments of changes in the specific provision level on the basis of changed CF forecasts. With the report wizard impairment-cases can be selected and isolated. For example it is possible to filter by status, unit of organisation and/or product. Furthermore states of different periods can be viewed and the consequences for the P&L are directly shown.